Would you like to create an unforgettable movie-viewing experience in your own home? Finished Basements NJ is here to help! With tons of home movie room design ideas, our creations will take your family entertainment to a whole new level! 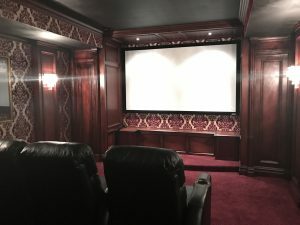 Why Install Home Theatre NJ? When you have your own movie room, a “staycation” will be the first thing on your to-do list! From basic technology that provides surround sound for your television, to the most state-of-the-art equipment and soundproofing that can transform any room, if you can dream it, we can make it a reality. That’s right, when we install home theater creations, your home gets an immediate entertainment facelift. No more standing in line or wait for certain times to see a film. With our new innovations and soundproofing technology, any room in your home can be your own personal movie room. And best of all, we have options that work with any budget. 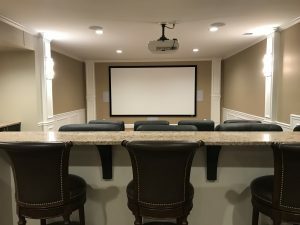 If you’d like to experience the type of home theatre NJ residents are raving about, contact us today at 732-928-3433.